As part of effort to serve the people of Wangaratta and its environ, the Zenith Medical Centre is introducing the latest advancement in the Skin Cancer Examination. 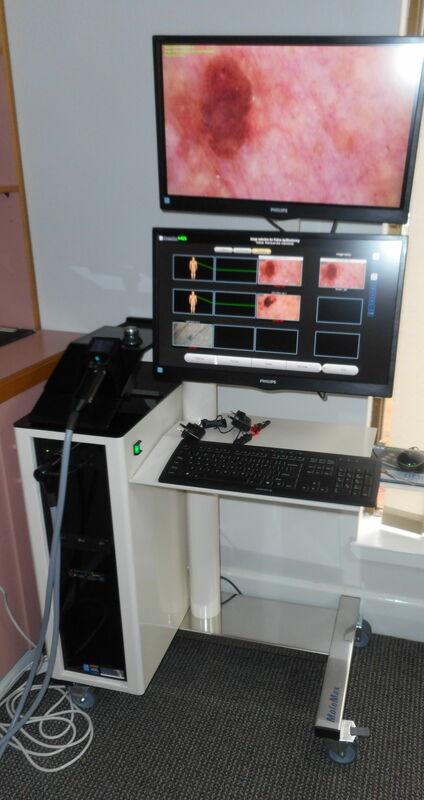 This is called the Digital Mole Mapping being made possible through the newly installed state of the art digital Molemax HD Machine. This new technology allows us to see 2mm below your skin. The machine also allowed for storage of photos for ongoing comparison for early identification and monitoring of the changes to the skin lesions. The use of this revolutionary MoleMAX digital scanner has shown that there are a number of early warning signs that can assist in the diagnosis of malignant skin lesions-thereby reducing guesses and almost eliminate unnecessary skin excisions or biopsies. The MoleMAX machine allows for very high magnification with special light frequencies to let the doctor look into the structure of the skin. This technology enables us to scan spots and moles 2mm under the skin to determine with great accuracy the likelihood of the presence of Melanoma. It also has the unparalleled magnification of x40! What are the advantages of Molemax Body Imaging? MoleMax takes a digital image of the mole both on the surface and below the skin: Unlike the hand held dermatoscopes (magnifiers used by many dermatologists and GPs to check skin cancers) the MoleMax technology takes a digital image of the mole both on the surface and below the skin. It can also detect patterns not visible under a dermatoscope, which could indicate a malignant melanoma at an early stage of growth. The magnification also provides greater clarity of the features of the mole, and in some cases, can eliminate the need for a biopsy or excisions. Now with our Mole Max HD we can visualize the mole more accurately and diagnose with more confidence. PLEASE NOTE, DESPITE ALL OUR ADVANCEMENTS IN TECHNOLOGY, NO MELANOMA SURVEILLANCE PROGRAM CAN CLAIM TO BE 100% ACCURATE. Our Recommendations: Two in three Australians will develop skin cancer before the age of 70. The good news is that 95 percent of skin cancers can be successfully treated if detected early. A simple check could save your life. We should all check our skin regularly. Get to know your skin and take immediate action if you notice any changes. If you have fair skin, blue or green eyes, fair or red hair or lots of moles or freckles you are at high risk of developing skin cancer. We recommend a full skin cancer screening every 12 months and more if you are at higher risk of skin cancers eg. A family member with melanoma or other skin cancers. If you have red hair, fair skin and blue eyes. History of sunburn and blistering. Previous solarium or sun bed use. If you have an outdoor life or occupation. If you have had a previous skin cancer. If you have a lot of moles. Cumulative UV exposure also contributes to your risk of developing skin cancer. So if you grew up in Australia, work outdoors or spend lots of time in the sun you should take time to protect and check your skin. How Long Does the Scan take? A full scan takes about one hour while partial checks can take around 30 minutes. The procedure is completely painless. How do you prepare for Skin Screening Appointments? To enhance our ability to assess the skin we request that no make-up be worn for screening appointments. We also advise to bleach any nail paints to gve a clear view of the nail and its bed. Moisturiser without sunscreen or tint can be used. Deodorant can be used (it will not affect our screening process). Avoid sunburn by minimising sun exposure when the SunSmart UV Alert exceeds 3 and especially in the middle of the day when UV levels are most intense. Seek shade, wear a hat that covers the head, neck and ears, wear sun protective clothing and close-fitting sunglasses, and wear an SPF30+ sunscreen. Avoid using solariums (tanning salons). FEE: The fee for a MOLE MAX TOTAL BODY SCREENING is $300. The consultation fee will also be charged depending on the time spent for the body screening. Your Medicare rebate for the consultation fee depends on your concession status. For partial skin check the average cost is $110 with corresponding consultation fees. We also have provisons for mole checks with the Mole Max machine. We use a devise called Dermoscope to assess the nature of you skin. At this stage there is no Medicare cover for the MoleMax Skin Check procedure. Insurers' policies are quite dynamic and as such we cannot provide guidance on which ones provide coverage (full or partial) for the MoleMax procedure. Please enquire from your provider requesting details on coverage for "Melanoma surveillance imaging and diagnosis".